“The Hunger Games” and Food… Two Things I Love! I’ve been incredibly obsessed with “The Hunger Games” lately. I finished the first book last Saturday and I was in the movie theaters, anxiously waiting for the movie to start that same evening. For any fellow Hunger Games readers out there, you probably remember Katniss mentioning her favorite food in the Capitol- lamb stew over wild rice. Since I first read those words, I couldn’t get the stew out of my mind. I just kept picturing the dish while my mouth watered more and more each time I thought about it. Which brings me to my point: I had the stew today. 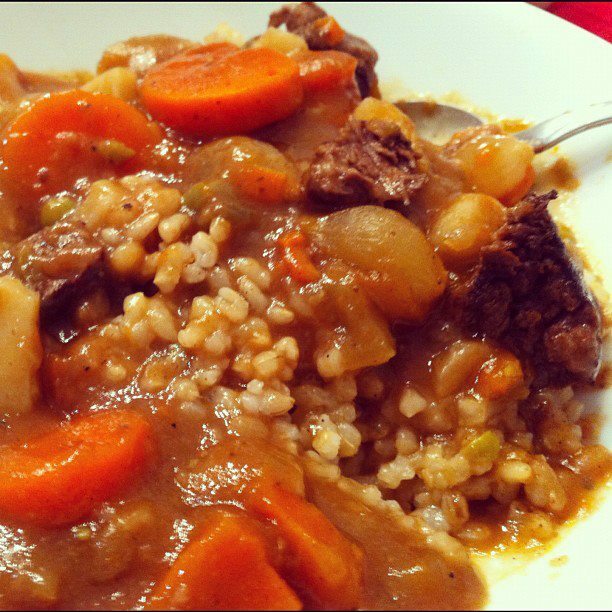 Well, not the lamb stew Katniss described but a variation. I actually went to Whole Foods today with my family and stumbled upon the soup counter by the meat section. There it was… The pot labeled “Beef Stew.” I had tried it before but it hit me this would satisfy my craving for the famed Capitol dish. I served myself the biggest portion available of stew and then went to the hot food counter to get a serving of wild rice. Much to my surprise/dismay, there was no wild rice available. There was, however, brown rice. I figured that would do and served myself a small portion.